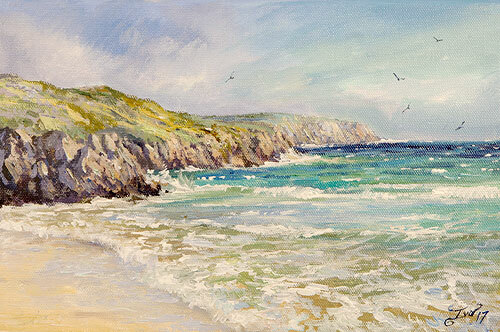 This painting depicts beautiful Cliff beach at the height of Sumer. An Atlantic beach, it is alive with breakers in a warm July breeze. Wild flowers adorn e machair and are a joy to behold. The breaking waves are relentless and hypnotic and for me really brought this painting alive. One of many stunning beaches in Uig; many tourists do not venture to this hidden part of Lewis as it is quite remote.